SF will premiere Canadian sci-fi series Continuum, a one-hour police drama about a cop from 65 years in the future who finds herself trapped in present day Vancouver. 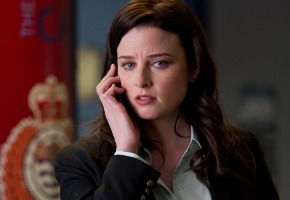 Rachel Nichols (Criminal Minds, Alias) stars as Kiera Cameron, a cop from 2077 who finds herself trapped in the present day. When a group of fanatical terrorists escapes their planned execution in the year 2077 by vaulting back in time, they inadvertently sweep dedicated City Protective Services officer, Kiera, along with them. With unexpected assistance from teen tech genius Alec Sadler (Erik Knudsen; Jericho, Scream 4), Kiera infiltrates the local police department and forms an uneasy alliance with her new partner, detective Carlos Fonnegra (Victor Webster; Castle, Melrose Place). Though desperate to get back to her husband and son, Kiera concentrates on bringing down the terrorists before they can change the course of history forever. Thursday February 21, 2013 at 9:30pm AEDT. @Goatracer Alphas went 2 season’s, and got canned! I hope this show goes beyond 2 seasons. Great show! Been waiting for Contiuum, have heard good things about it. Really good show indeed. Although I was wondering when it was going to be shown here. This is excellent,I scour the cinematic depths of the world for good Sci-Fi and can not wait for season Two.The simple fact that it has got a second season means it has to be good as unlike other genres only the best Sci-Fi gets a second series. This is a nice show, if you like SciFi and time travel then watch it. There is a nice twist at the end of the season. It returns for a 2nd season (in the US) in April.